To pass your driving test, you have to pass both the theory test and the practical test. The theory test comes in two parts - a multiple choice section of 50 questions and a hazard perception part with 14 clips. You have to pass both these sections in one sitting to pass your theory test. 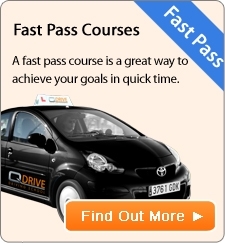 As a Q Drive learner, we want to help you as much as we can to help you pass your test quicker. Your driving instructor can provide you with training aids such as our popular text quiz. Where the instructor will text you some theory questions on a weekly basis so you'll be learning on the go! Wondering how to pass your theory test quicker? We've made it easy by giving you the links to the latest driving study techniques on the market. Practice theory questions while you're on the move by downloading the Driving Theory app. Q Drive has tested several apps out and have found the UK Driving Theory App to be the best on the market. This book has all of the questions and answers contained in the theory test data bank. This book contains road signs, road markings and general rules for all road users.